The Boston Landmarks One City Choir performed with the Boston Landmarks Orchestra at the Hatch Shell Thursday. 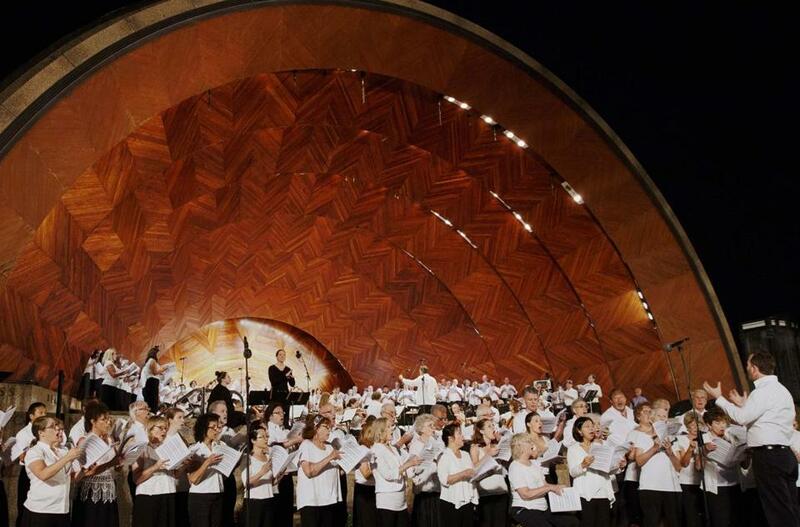 The concave hull and blocky stone wings of the Hatch Memorial Shell make anything inside it look impossibly far away, including the musicians of the Boston Landmarks Orchestra as it presented its rain-date all-Beethoven program on Thursday night. However, the appearance of distance did not translate to reality, as the Landmarks Orchestra went to remarkable lengths to connect with its audience on many levels. Wilkins then introduced the violinist Adrian Anantawan, a musician and educator who was born without a right hand and holds his bow with an adaptive device. He contributed a luscious and smooth but never cloying solo to the Romance No. 2 in F major. The sound balance treated him better than it treated the orchestra; all night, the large ensemble sounded crackly and two-dimensional through the amplification. Three selections from the music for “Egmont,” including the famous Overture, closed out the second half. Soprano Michelle Johnson sounded clipped and slightly detuned in the martial song “Die Trommel gerühret,” but the brisk Overture was hearty if bass-heavy. The evening’s centerpiece, Symphony No. 9, radiated warmth and sincerity. The sound balance was bassy and flat again, but there was a charm to the experience, like seeing an old recording played out in front of the eyes. Wilkins handled the second movement scherzo with a light touch, energized but not a cavalry charge, and the Adagio floated in bliss. The vocal soloists were mostly in fine form; Johnson was still out of tune, but tenor William Hite and baritone Ron Williams’s duet was heavenly. More important was the Boston Landmarks One City Choir, a community ensemble that welcomes new members whenever the orchestra needs a large chorus. Its singers were so numerous that all of them could not fit on the stage, so some had to stand below it with auxiliary conductor Scott Allen Jarrett. The sound was massive and honest, and full to bursting with joy. Large-print and Braille programs were on offer, and two American Sign Language interpreters communicated the mood of the music through a ballet of hands. Babies fidgeted on blankets next to sun-hatted seniors. Assistant conductor Kristo Kondakci managed the “Maestro Zone” on one side of the lawn, where a small podium was set up and white batons (actually pencils) were offered to anyone who wanted to try “conducting” the orchestra. A coterie of ascendant pint-size maestros clustered around him throughout the symphony, pencils bobbing up and down with the beat. And still more kids leapt and danced to the “Ode to Joy” on the asphalt in front of the stage. The community-supported orchestra visibly strove to support the community, and the community supported it right back. At Hatch Memorial Shell, Aug. 3.